Gordon – fresh & clean Investments & Insurance Company WordPress Theme. It is designed for insurance company, companies that provide business consulting, investment advising, and tax assistance to corporate and individual clients. Also it works for financial agency and law companies, and individual tax/finance advisors. In fact, Gordon’s design is quite multi-purpose, so you can use the theme to build any business website, organization or firm. 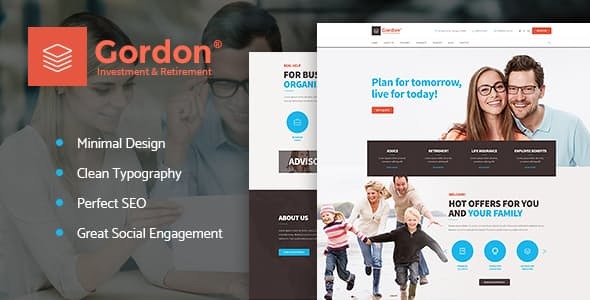 Gordon’s clean and modern design will give your website a new fresh look; its layout is perfect for mentioning all your key services which will help you establish a reputation of professionalism and reliability. Besides, WPBakery Page Builder support allows you create even more layouts at your taste. Different blog styles let you present useful information on taxes and accountancy in a more attractive way. This business theme is SEO friendly and totally responsive which is a key factor for user attraction.